The attorneys and legal assistants at Berecz & Associates PLC have all been on your side of divorce lawyer’s desk. None of us planned to be there. All of us were terrified at some point. So much is at stake. What’s going to happen with the kids? How am I going to come out of this financially? Who will keep the home? Some of us got great advice during our divorces. Some of us weren’t so fortunate. All of us have co-parented with a former spouse. We get it. And those experiences have contributed to our mutual and strong commitment to serving families. Across the lifespan, our continuum of care starts with providing prenuptial agreements before marriage, assisting in adoptions, preparing wills and other estate planning documents, supporting and representing families through divorce, and handling elder law/lifespan concerns. Regardless of the point at which we may assist you and your family along this continuum of care, we do it differently around here. You want a lawyer who doesn’t take over your life, assuming you checked your intellect at the door. You want a lawyer who partners with you and who fully understands your unique needs and explains all available options so together you can make informed decisions. That’s how we do it around here. We believe that you, the person most affected by legal decisions, ought to be at the table when those decisions are made! 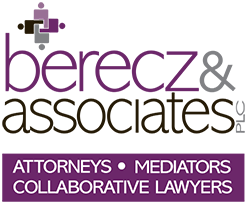 Deborah Bennett Berecz assists clients in Mediation or the Collaborative Process as they transition through a divorce with integrity, dignity, and respect. She also mediates lifespan law issues and takes great joy in representing birth and adoptive parents as they create a family through adoption. For more information about Deborah, click here. Albert Mais, of counsel with B&A, is an experienced litigator who has conducted numerous trials and hearings for almost 20 years. Albert has the unique ability to cut through the morass of information and documents that are generated in a divorce process, see the issues clearly and provide spot-on advice when you are confused. Tammy Gaul has been a legal assistant at B&A since February 2015 and she loves her job. As the voice you are likely to hear when you call, Tammy appreciates how much energy and courage it took to make that first call. You will experience her great care for people in distress and come to appreciate her knowledge about what is necessary to process through a divorce. We do it differently here. And you will find that we strive to provide a comfortable environment to discuss your concerns and fears. Together we can determine the most effective and efficient process or service for you and your family. We look forward to talking with you. Welcome to our firm. We do it differently here. We work with clients to craft creative solutions as clients transition through divorce and adoption, into marriage with premarital agreements, and throughout the lifespan with estate planning and administration. Our goal is to ensure that clients have a relationship and financial peace by employing the right process for the need: Litigate when necessary, mediate or collaborate when appropriate. But always focused on solving problems and preserving family relationships.